This best pocket knife is 8.25 inches long in open position. The beautifully designed wood handle is 4.5 inch long. Our pocket knives for sale are unique knives and built with best knife materials. This cool knife is a very good gift for your friend as this is a cheap knife because we are a wholesale knife company www.KnifeImport.com. 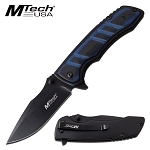 This best pocket knife is 8.25 inches long in open position. The beautifully designed wood handle is 4.5 inch long. Razor sharp 3cr13 steel blade is a legal 3.5 inches long. Spring assisted knife also has a pocket clip attached to the back of the handle.